We install only top-rated windows for the best in long-lasting beauty and performance. Bow windows are a beautiful addition to any room, and they add charm to both the interior and exterior of your home. Comprised of four or more windows, Buckhead bow windows form a gentle curve that allows natural light to flood the space. Choose from fixed or operational windows—both of which have the energy-efficient features you want! Buckhead garden windows give you a place to grow herbs and other small plants or to use as a spot for displaying collectibles. Because the window extends away from the house, lots of natural light can enter. Many homeowners choose optional side vents to allow for added ventilation. 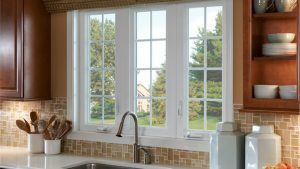 Like all of our replacement windows, our garden windows are made with low-e glass and several other energy efficient features. Tight Line Exteriors offers top-rated brands of Buckhead home windows in many styles including casement, double hung, bay, picture, awning, and slider. Whether your home is a Victorian charmer or a stunning modern condo, we have windows that will blend perfectly with your home’s aesthetic. Plus, all of our replacement windows have the security features and energy efficiency you expect in a quality window. Getting an expert window installation is just as important as choosing quality windows, and our team has the expertise required to ensure a flawless installation. Our courtesy is as impressive as our craftsmanship, and our customers appreciate the extra measures we take, such as cleaning up the job site and touching up the trim around the new windows. When you’re ready to upgrade your windows, contact the area’s replacement windows experts! Give Tight Line Exteriors a call today to speak with a member of our team, or fill out our online contact form now to request a free, no-obligation estimate.